Effective information and knowledge resource management is a driver of competiveness. Many developing countries have put mechanisms in place that seek to match knowledge-based economies, where information has become the fuel for responsiveness, innovation, and competition. Concepts and Advances in Information Knowledge Management brings out emerging and current discussion from the sub-fields of information management in this environment. 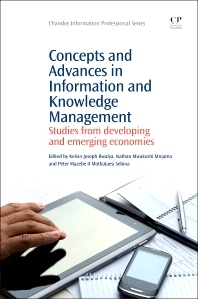 This title consists of sections on key aspects of information knowledge management and addresses knowledge management, library studies, archives and records management, and information systems. Kelvin Joseph Bwalya is Senior Lecturer in computer information systems, Department of Library and Information Studies, University of Botswana and Senior Research Fellow, University of Johannesburg, South Africa. His current research areas include Business Intelligence, Information systems (e-Government, databases, business process modeling, semantic information retrieval and analysis, labour market information system design, etc...), information management (data quality metrics) and virtual reality. Nathan Mwakoshi Mnjama is a Professor of Archives and Records Management, Department of Library and Information Studies, University of Botswana. Peter Mazebe II Mothataesi Sebina is a Senior Lecturer in Archives and Records Management, Department of Library and Information Studies, University of Botswana.